Monitoring is an essential part of managing infrastructure. It helps you to ensure that your business keeps running smoothly, by alerting you to problems as they occur. Nagios is a very popular open-source application monitoring application. It features a “plugin”-based approach to monitoring, which makes it very flexible and well-suited to perform any kind of monitoring. Nagios is available in two variants — “Nagios Core” is the free and open-source product, and “Nagios XI” provides additional functionality, but requires a software license. In this article, we will see how to install Nagios Core on a Linux server and use it to monitor the statistics of another server. Since we will solely focus on Nagios Core, we will simply call it “Nagios” in the rest of the article. Nagios offers monitoring and alerting services for applications and infrastructure. It watches hosts and services that you specify, and alerts you when problems arise and again when things get better. A Nagios monitoring setup consists of a number of components, as shown below. 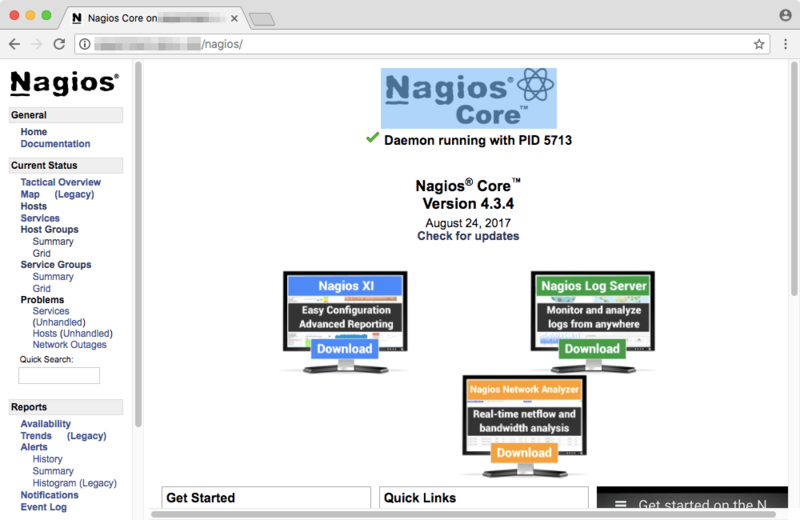 The Nagios daemon relies upon plugins for its monitoring and alerting functionality. These plugins, along with your configuration, determine which hosts and services will be checked. Usually, these are “active checks”, which means that daemon invokes the plugin at regular intervals, and gives it information about what needs to be checked. Then, the plugin performs the check, and reports the status of the hosts and services back to the daemon. A check could involve a “ping” to see if it is up, measure a host’s disk space, and so on. On the other hand, there are “passive checks”, which are initiated by external applications. Instead of the Nagios daemon doing a check, the external application submits data to the daemon. In addition to reporting the status, a plugin can also add some performance information. Although Nagios itself cannot understand this data, you can ask it to store this data to a file or process it by executing commands. By using a plugin like N2RRD, you can save this data in a “round robin database”, for later querying and graphing. 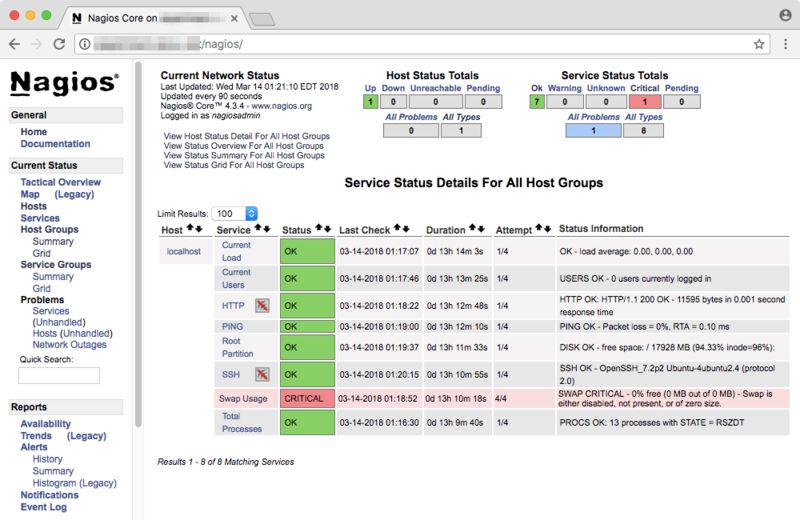 Nagios provides a web interface to help you see this status information. You can also configure alerts via email. Moreover, there are plugins that can deliver alerts through SMS or other media. In this section, we will install Nagios on a Linux installation, and then configure it to monitor host resources. 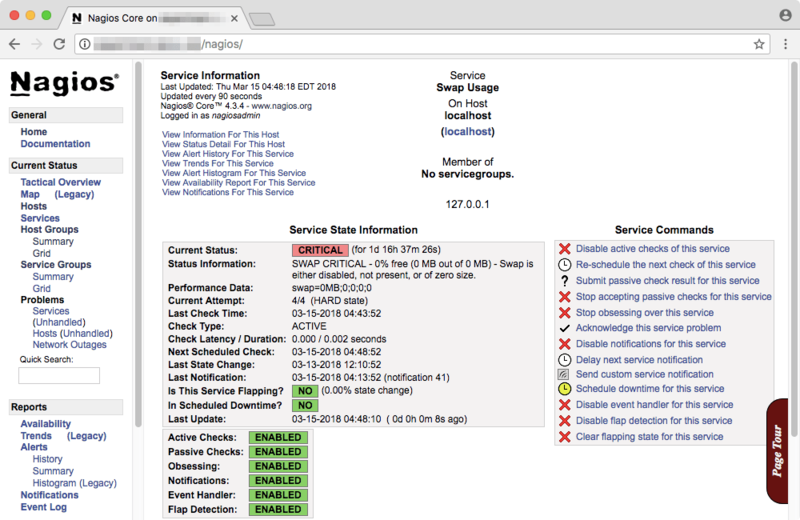 We will also set up the Nagios Remote Plugin Executor (NRPE) on another host, so that we can monitor it from the Nagios server. The instructions below have been tested on Ubuntu 16.04 and CentOS 7. To follow the rest of this guide, we assume you will execute all the following commands as root. Depending on your distribution and setup, you can run sudo -s (and type in your password) or su (and type in the root user’s password) to get access to a root shell. In order to begin with the installation procedure, we will first install a few dependencies. These include the Apache web server and PHP for the web interface, as well as tools like gcc and make for compiling programs. 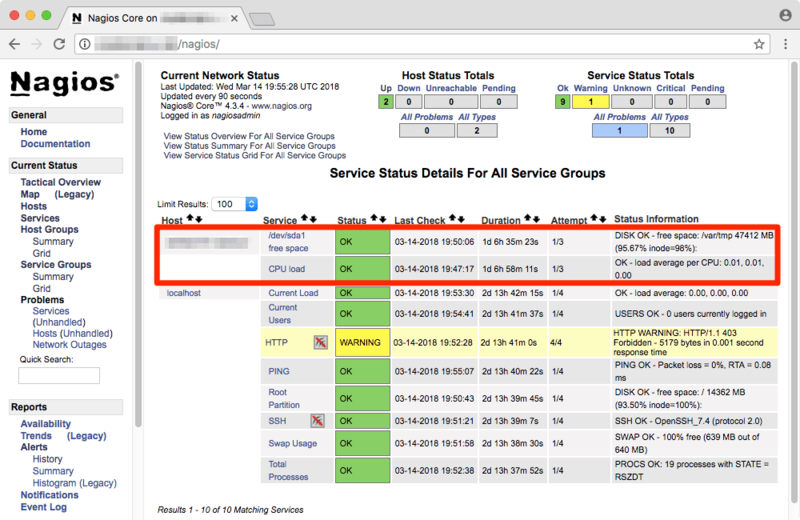 Since Nagios uses CGI scripts, you cannot use a server like Nginx. Now that we have the basic setup in place, we can install Nagios. Finally, we will configure Nagios to run automatically on boot. However, we won’t start it just yet, as we have not configured it. Now, we will configure Apache. Again, depending upon the distribution you use, the steps here vary slightly. If you use Ubuntu, you need to enable the “rewrite” and “cgi” modules, and then restart it. Finally, we will protect the Nagios web interface by adding a username and password. In this article, we will use the username “nagiosadmin”, although you can choose something else as well. You will be prompted for a password. If you can see this page, congratulations! You’ve installed Nagios correctly. The web interface allows you to take a quick look at the status of monitored hosts and services. A “service” in this context refers to some observable aspect of a system, like its disk space or memory consumption. By default, Nagios only monitors the host it is installed on. In order to get a basic overview, you can click on “Host Groups” on the left. 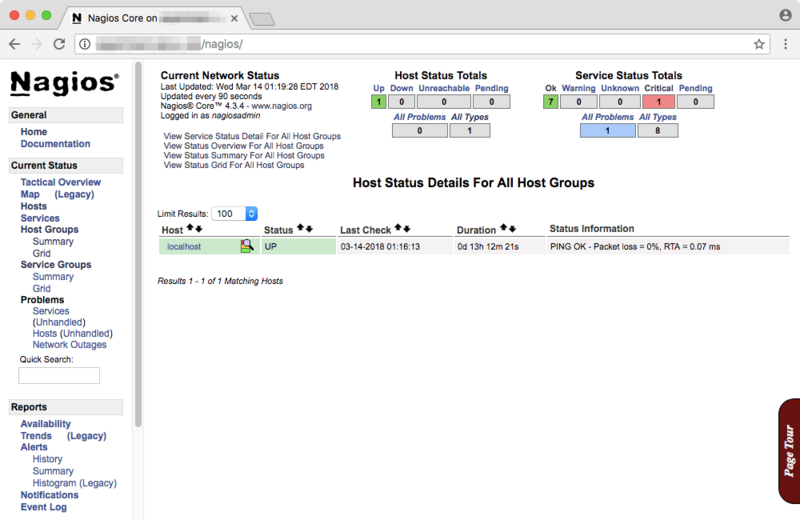 In the above example, you can see that “localhost” (which refers to the system where Nagios is installed) has a host status “UP”. Seven services are marked as “OK” and one is marked “critical”. On your system, you might find a different scenario than the one above. If you want to see a detailed report about the hosts, click on “View Host Status Detail For All Host Groups”. Similarly, you can click on “View Service Status Detail For All Host Groups” to view details about the services. You can click on a particular entry to view more details about it. For example, here is the “Swap Usage” information page for the current node. You can also issue a number of service commands from the right, such as disabling the check. So far, we have set up Nagios to only monitor the host the host it is running on. Now, we will use NRPE to monitor the disk usage and load average of a remote host. 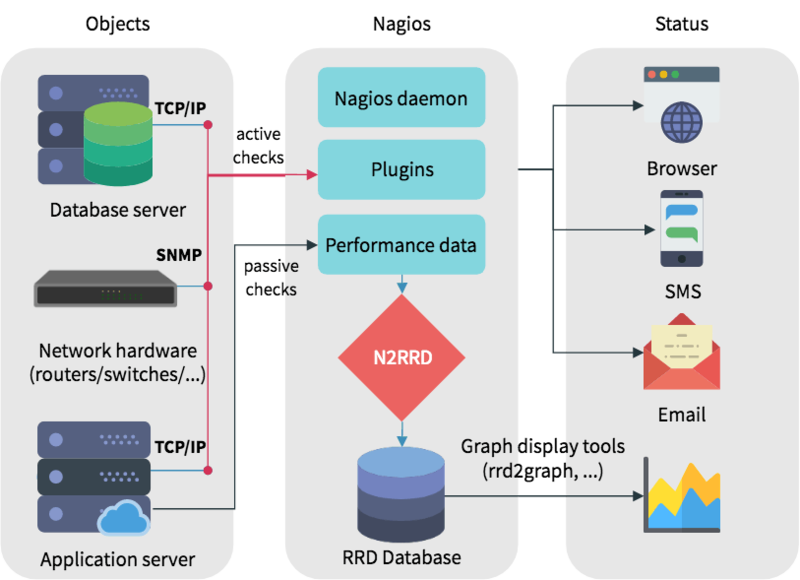 There are several steps to this — installing the check_nrpe plugin on the Nagios server, and the NRPE daemon on the remote host. Finally, we need to edit some configuration files. Next, configure the “Makefiles” as shown below. Then, we will set the NRPE daemon to run automatically on boot. We will also start the daemon to test it. If you see a version number, this means that NRPE is up and running, and Nagios can reach it. If you see an error instead, verify that your firewall allows traffic on TCP port 5666. Here, we have named our command check_sda1. You can give it any name, as long as you are consistent with your scheme. Then, we define the command. Here, we said that the check_disk plugin should give us a “warning” when the disk space is at 20% or lower. If the disk space falls to 10% or lower, it should mark the status as “critical”. In this above snippet, we have used max_check_attempts to set number of times that Nagios will retry the host check command if it returns any state other than an OK state. Then, we have used check_period to control when the host should be checked. Here, we have set it to 24x7, which has its usual meaning. The notification_interval directive controls the time after which any notifications will be resent. Here, we have set it to 30 minutes. (So far, we haven’t configured notifications yet, but we will do so in the next section.) Finally, we use notification_period to tell Nagios when it should send out alerts. Now, you can find details of the host in the Host/Status details. At this point, we have a working Nagios configuration, and we can see any problems in the web interface. However, it is more useful if we get notifications instead. By default, Nagios assumes that your system has a /bin/mail command using which it can deliver emails. However, in this article, we will deliver our emails through SMTP, with a service like GMail or Yahoo. First, if you want to use a service like GMail or Yahoo, ensure that access for “less secure apps” is enabled. This is required so that non-interactive applications can send out mail. Then, open the /usr/local/nagios/etc/objects/contacts.cfg file. Inside this file, there will be a contact block with an email directive. Find the line and add the email address where you want alerts to be delivered. Save this file and exit the editor. The next step is to download a command-line SMTP client — we will use this in our article. If you use Ubuntu, you have to install a few dependencies first. Replace the part containing /bin/mail -s with /opt/smtp-cli-master/smtp-cli.php. Repeat this process for the block containing the notify-service-by-email. You should wait for a few minutes till Nagios performs the check and sends out an alert. Later, when you get a mail, you can simply remove the zero.bin file. 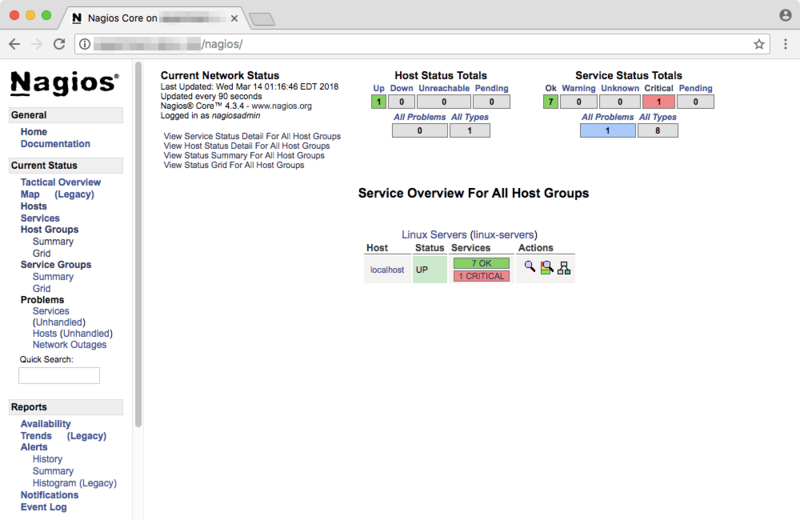 In this article, we installed Nagios and configured it to monitor another host. We have also seen a few examples of how to write your own commands and how to configure alerting. If you are interested to learn more, be sure check out the Nagios documentation. If you want to have a nicer web interface, have a look at Ninja.